The hugely successful KTM 450 SX-F powerhouse has extremely compact dimensions, strong performance throughout the rev range and a low weight; this is the lightest 450 engine on the MX market. But that doesn’t mean it’s not a heavyweight in terms of muscle. Fitted with a single overhead camshaft cylinder head and the latest electronic fuel injection, it pumps out unrivaled horsepower. With KTM’s engineers working tirelessly to increase the ultimate READY TO RACE machine, this powerhouse has the latest engine management technology on board and confidently shoots both amateurs and pros to the top of their time sheets. The 450 SX-F’s crankshaft utilizes a short connecting rod, which makes for an overall compact and lightweight engine with a snappy power delivery. A plain big-end bearing with two force-fitted bearing shells runs directly on the crank pin. The necessary oil feed for this bearing is ensured by the engine’s pressurized lubrication. This design is a decisive benefit in terms of the crankshaft service interval, which can be lengthened due to the plain bearing. So just pin it, all day long. The design of the die-cast engine cases allows for minimal weight and a very centralized shaft configuration. This makes the engine short and compact, while contributing to an efficient centralization of masses. The engine covers also feature a solid surface structure, which reduces the wear caused by the rider’s boots. This way, your SX-F will keep looking better longer. The state-of-the-art Keihin Engine Management System with electronic fuel injection features a 44mm throttle body. Thanks to its unique injector position, the engine’s response is instantaneous. And to make life even easier, separate systems for cold starts and idle adjustment await you. The lightweight ECU features a unique traction and launch control system for lightning-quick response when the gate drops and maximum grip thanks to different maps that sync with to the gear you’re in. It’s also possible to unleash an even more powerful mapping via the handlebar map switch. Inside the short cylinder, with a bore of 95mm, thumps a box-type piston made by CP. Its crown geometry is adapted perfectly to the high-compression combustion chamber, where its rigid structure and low weight shine. Thanks to the low oscillating masses, the engine is as snappy as it is strong. The KTM 450 SX-F is fitted with a unique E-starter as standard, which is a clear advantage when it comes to crunch time in the heat of battle. A strong starter motor made by Mitsuba will fire time and time again at the push of a button. The side-mounted counter balancer does double duty also driving the water pump. Thanks to its perfect balance and low oscillating masses, engine vibration is kept to a minimum. 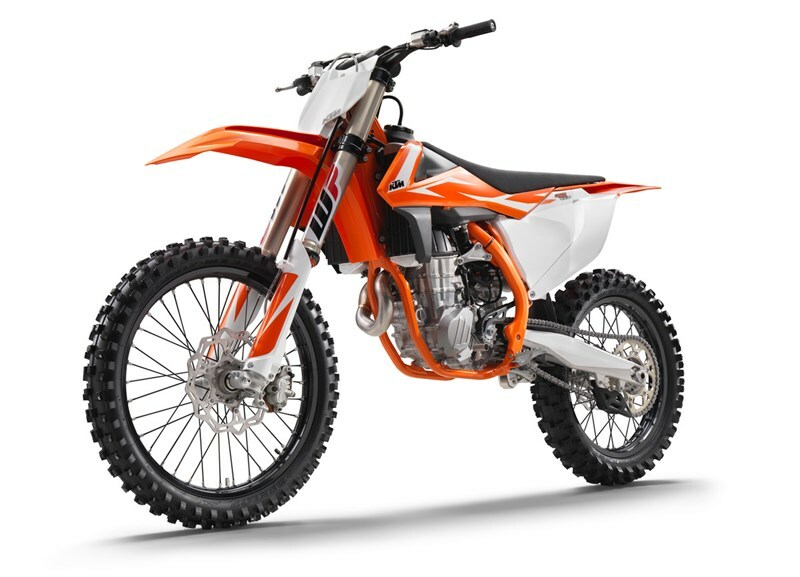 The 450 SX-F employs the KTM-developed DDS clutch (damped diaphragm steel) with a wear-free steel basket and extremely heat resistant clutch plates. This clever design employs a diaphragm spring instead of the usual coil springs, making for considerably easier clutch action. A diaphragm spring also leaves sufficient space for a damping system to be integrated into the clutch hub. The goal is traction, but durability is as well. A lighter basket, a reworked inner hub and a pressure plate providing better oil supply and unsurpassed cooling up the longevity of the DDS clutch. Light operation and telepathic amounts of control are standard with this hydraulic Brembo actuated clutch. The KTM 450 SX-F uses a lightweight 5-speed transmission with gear ratios that are perfectly matched to the power delivery of its large displacement engine. The 1st and 3rd gears are treated with a special surface coating for better reliability. An advanced ´No Dirt´ gear shift lever design prevents mud and sand from blocking the joint of the lever and guarantees trouble-free shifting. All 4-stroke engines are fitted with a gear position sensor, giving the option of different engine characteristics for each gear. For 2018, the transmission shaft gets a stronger shifting star and a C4 bearing that has a bigger overlap in the case. This guarantees better reliability even in extremely tough operating conditions.